Now this blog is not in defence of love or art as Toulouse-Lautrec spoke of so earnestly in the film Moulin Rouge. 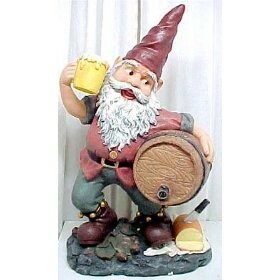 No, this blog is in defence of drunken, vice-ridden gnomes. Specifically, where the bloody hell have they all gone? Ask any of your mates and I bet at least one of them will be on some type of health/fitness/food allergy kick at the moment. Maybe they have given up sugar for a week or decided to be sober for a month or committed to a punishing exercise regime as they want to take part in a 3,219km ultra-marathon in a year’s time. Fun times ahead. Before I go on, I must confess that I write this blog after completing a vigorous weights session at the gym and having eaten a dinner stacked with three serves of veges and an unusually delicious vegetarian unmeat concoction. However, the weights session is because I am vain and single at 40 – and I like to perve on the blokes while I am there – and the over-the-top healthy dinner is because that is what I actually like to eat. I can thank my step-mother very much for that. Recently I did 62 days without drinking (did you notice?) and learned yet again that I am just as crazy with or without alcohol. That doesn’t mean I want to stop it forever though. I also, finally, said goodbye to my chocolate addiction, which was surprisingly easy and depressing at the same time, because if I’m going to get the teeth of my bank manager’s dreams, I should really stop eating so much crap. But sometimes I still hanker to be a vice-ridden gnome – even if only momentarily. Indeed, two weeks’ ago, I wandered around Brisbane’s nightclub district on a Friday night dressed as a clown, complete with face make-up, after a 40th finished too early for me and I didn’t want to go home. Not after so much effort with my costume. But part of me just wanted to see if they would let me in (three out of four nightclubs did) and part of me just wanted to see people’s reaction. I also have to admit that part of my motivation that night was my long-lost love of being a party animal. These days the opportunities are just less and less but the attraction still burns just as bright as ever it did. But it’s the better appreciation of my own mortality that is usually the only thing that stops me from over-indulging in absolutely everything. These days, alas, the only thing that goes up my nose is a pair of tweezers. I asked my best friend on Friday whether she remembered us sitting around smoking ciggies and not even considering them a vice at all, let alone giving them up. She smiled as she nodded and we both reminisced fondly about those carefree days, when vices were not vices they were just super-fun habits which we would sort out one day when the time came. That day of reckoning was long ago and we did what we had to do. Now ciggies are not something that I ever want to be acquainted with again, but not because they’ll kill me. No, it’s because they made me feel like crap. One of my favourite quotes is from American writer Kurt Vonnegut who once said that smoking cigarettes was a more classy way of committing suicide. Unfortunately, he didn’t live long enough to find out, because he fell down some stairs (probably pissed) and died of massive head injuries. A very literary way to go out in my opinion. Kurt was a vice-ridden gnome, so was Hunter S Thompson, and William Burroughs too. Unsurprisingly they also are the writers who I admire the most and try to emulate, with a feminine twist, wherever possible. They are all dead because of their vices and I do know that’s not the way I want to go. But becoming a yoga and quinoa devotee is not going to make me a better writer – it will just make me boring and thin. So here’s to vice-ridden gnomes everywhere. Even if they only come out of hiding every now and then, and then disappear back to where they came from to lick their hungover wounds clean.